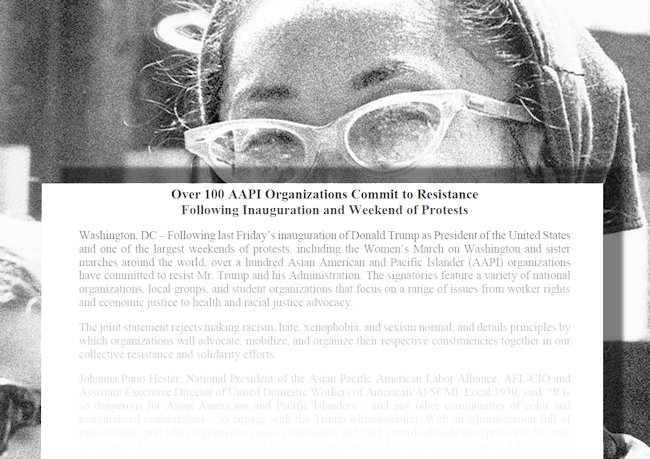 Reappropriate has proudly joined over a hundred Asian American & Pacific Islander (AAPI) organizations who have come together to sign a statement of collective resistance against the hatred, intolerance, and open discrimination normalized by the election of President Donald J. Trump. We stand at a critical juncture in world history. The election of Donald Trump as president of the United States represents a direct threat to millions of people’s safety and to the health of the planet. As Asian Americans and Pacific Islanders (AAPIs) committed to equality, inclusion, and justice, we pledge to resist any efforts by President-Elect Trump’s administration to target and exploit communities, to strip people of their fundamental rights and access to essential services, and to use rhetoric and policies that divide the American people and endanger the world.